Joshua Allen has created his own personal language on the tenor saxophone, with an emphasis on polytonal and asymmetrical phrasing, as well as extending the range and sonic ability of the instrument. He does this with constant emphasis and study of the overtone series, and the generation of multiphonics from the application of this process. 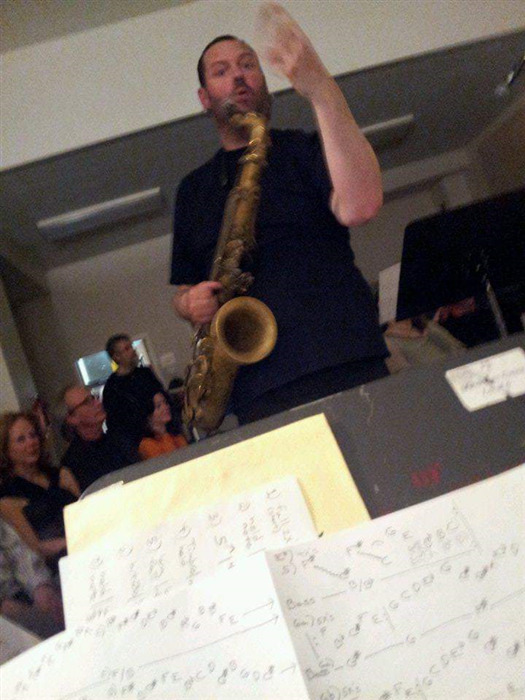 He is currently teaching Fellowship students at the Brubeck Institute at the University of Pacific. He was born in Berkeley, California in 1972. Like many of today’s prominent musicians, Mr. Allen was a product of the Berkeley public school system, studying saxophone starting at the age of nine under Phil Hardymon. He went on to study with such prominent Bay Area musicians as Bill Aron, Joe Henderson, and Rory Snyder. With his focus squarely on jazz composition and performance, Mr. Allen moved to Southern California in the early nineties to study with Rick Helzer at San Diego State. He became active in the Latin Jazz community, and worked with various musicians such as Dennis Chambers, and Eddie Palmieri. Mr. Allen’s return to the Bay Area in the mid 90s to finish his Bachelors degree at Sonoma State. His association with saxophonist Marco Eneidi led to working relationships with musicians such as Glen Spearmann, Matthew Goodheart, Damon Smith, and eventually Cecil Taylor. Josh Martin is 1/3 of the band VOCO and 1/2 of the experimental unit Conan The Barbiturate- both heavily amplified endeavors. This will be his first formal solo bass set, and will use no effects or looping of any kind. Only a 1968 well-weathered Univox bass and a tiny amp.